I am constantly amazed at the level of devotion as well as the exquisite results that dedicated bird photographers like Arthur Morris are able to attain. Such photography is truly a sub-specialty and, like most areas of expertise, the casual dabbler simply can't expect similar results. Some might argue that this is because of the specialized and expensive equipment that is needed. However, it goes well beyond equipment. It requires the interest, the study, and ultimately the love of the subject and the genre to achieve the type of level of excellence that Mr. Morris has attained. 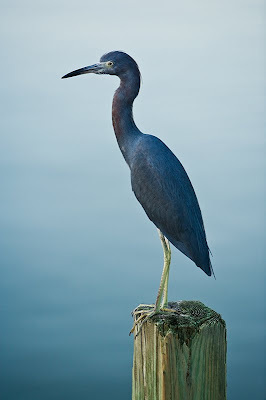 With that said, during my trip to Sanibel Island in December, I couldn't help but try to take a few shots of the herons that would land outside our condo in the evenings. I knew these hand held shots wouldn't be perfect......but they were fun to take! Sunrise is one of the things that many people who are not photographers often miss. Even though I frequently do take the opportunity to get up to photograph the rising sun, I still am almost always amazed at how quickly the color, intensity, and quality of light can change at this time of day. These changes are some of the aspects of light that are often missed by folks who are not photography oriented, either because they aren't awake for sunrise or don't pay as much attention to the nuances of light. 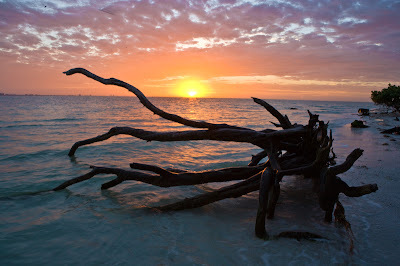 Several posts back, I wrote about a recent family vacation I took in Florida, at Sanibel Island. On a few of those days I got up early to photograph the sunrise. Here, in Western Pennsylvania, we often don't get a good view of the horizon because of the rather hilly terrain. 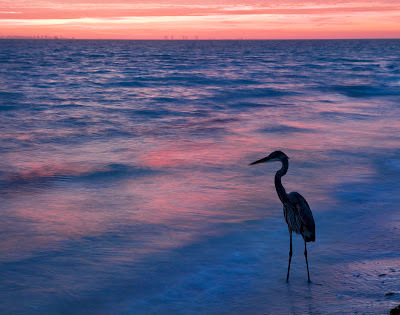 On Sanibel, there was horizon visible all around. Being able to see the actual horizon so easily made the changing quality of the morning light even more evident. Because you could see so far 'out', the changes seemed to occur much more rapidly than I had ever appreciated here at home. It was truly an amazing, almost surreal experience. Though I personally prefer the first image, partly because of the color of the light and partly because I like the way the slower shutter speed smoothed the water, I feel they each have their own special feel and appeal. 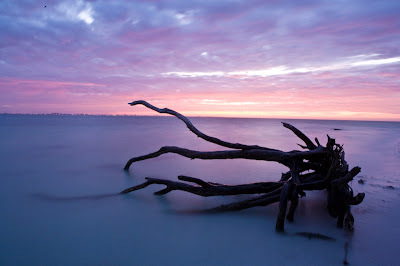 I should also add that I wonder if the image would look 'tidier' or better composed if the upper branch of the driftwood that breaks through the horizon line were cloned out. From a compositional standpoint, and without arguing about whether that type of cloning should be done, what do you think? At any rate, one thing is clear. Among the highlights of photographing is the chance to be awake to see, experience, and appreciate spectacles like this. Hard to believe that it happens most mornings! I made an image about two weeks ago that made me smile. I smiled not only because I was on vacation, not only because I was happy with the decision to get up before sunrise and do some photographing while everyone else was still asleep, and not only because I was outside in the midst of an unbelievable sunrise. Sure, all those things played a role, but what really intrigued me was the role serendipity can have while photographing. There I was on the beach at dawn with a most amazing sunrise unfolding. Suddenly, and out of nowhere, a Great Blue Heron flew up to me and landed a very short distance away. This in itself fascinated me because near my home in Pennsylvania there are some areas where an occasional heron can be seen, but they are very skittish and hard to approach closely. In Florida, where the birds seem much more accustomed to human presence, close approaches are not uncommon.....but, in this instance, it was the bird's choice to land right nearby. After he landed, we sort of looked at each other, and then the heron seemed to look out at the sunrise as well. I know that is anthropomorphizing, but that is just what it seemed like despite the fact that, in reality, it was probably looking for fish in the water. I had my 24-70 mm lens on my camera, and quickly racked it out to 70mm. The heron was still a bit small in the frame, so I slowly moved in a little closer while swinging the camera around towards the heron. He let me get a bit closer before I felt like I better stop the approach. Once he knew where I had stopped he didn't seem to pay much attention and let me shoot away. 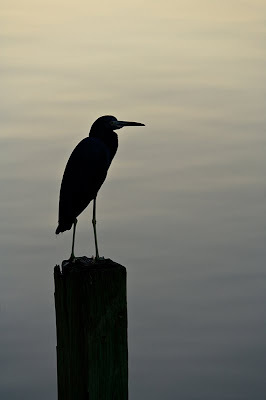 I tried to isolate his dark silhouette against the reflected colors of sunrise which seemed to emanate from the water. He ultimately flew away, but it was an experience that really ingrained that unbelievably beautiful morning into my memory. When I returned back to our condo everyone was still asleep and I very contentedly crawled back into bed to catch a few more z's myself. It was a particularly fun experience that day because I wasn't the only one out at that 'crazy hour'. There were three types of people up for sunrise that morning: the serious photographers, the serious shellers, and the serious fisherman. As I have frequently told my wife, I never feel more alive than when I am out photographing sunrise and have the opportunity to watch the world wake up.